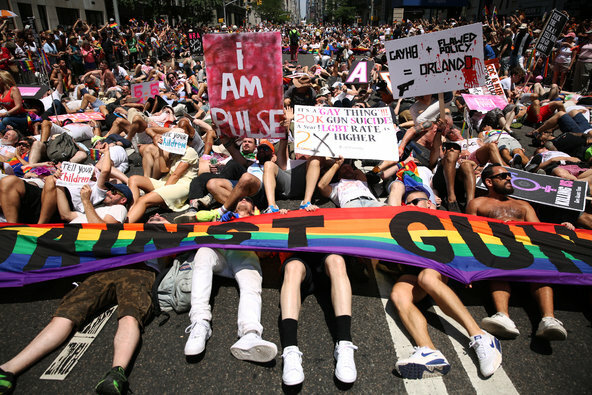 Gays Against Guns In The New York Times After Our First Time Up In A Parade! Okay? Showing Out. Coming correct and garnering international acclaim with our initial notices. We are GAG. New York was GAGging. Gays Against Guns, a new gun-control advocacy group, held “NRA Stay Away” and “NRA prepare to GAG” signs to wild applause. Jessica Dickerson, 32, who is a lesbian from Tampa, Fla., said she supports the gun-control issue. Signs referencing gun violence dotted the entire parade. Earlier, a group of people covered in white veils, some carrying white parasols marched in a moment of silence for the victims. Marchers fell to the ground in front of the Stonewall Inn, in a form of protest known as a die-in, as another marcher, Bruce Kreuger, 65, stood holding a sign written in Arabic. This entry was posted in Uncategorized and tagged Brian Worth, GAG, GAG Gays Against Guns, gay pride, gay pride parade, Kevin Hertzog, NYTimes by Billy Beyond. Bookmark the permalink.